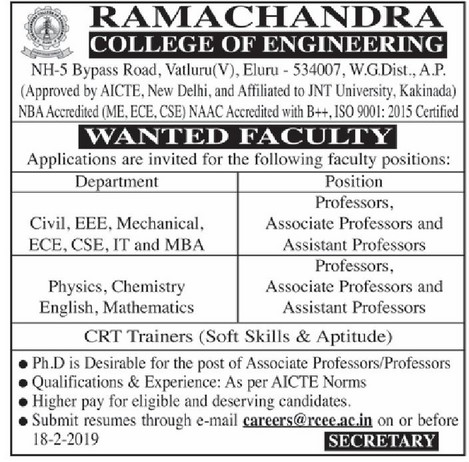 Ramachandra College of Engineering, West Godavari has advertised in the EENADU newspaperr for recruitment of Professor / Associate Professor / Assistant Professor / CRT Trainers (Soft Skills & Aptitude) jobs vacancies. Interested and eligible job aspirants are requested to apply on or before 18th February 2019. Check out further more details below. About College: The institute boasts of the State-of the Art facilities, well built infrastructure and a serene lush green naturally landscaped sprawling campus far from the hustle and bustle of the town, providing congenial environment for learning. RAMACHANDRA COLLEGE OF ENGINEERING is a vibrant, forward looking Institution offering a high quality learning experience with a welcoming and friendly environment. Higher pay for eligible and deserving candidates.